With a bold, cartoony vibe and parkour gameplay inspired by the original Mirror’s Edge, Hover: Revolt of Gamers won over the gaming community in May 2014. As such, it raised a whopping $116,398 through Kickstarter. Although it draws upon the free-running and vaulting concept of cult classic Mirror’s Edge, it isn’t a ripoff project in any sense of the word. Hover: Revolt of Gamers is set in a sci-fi city, with an option to alternate between first and third-person views, as well as single and multiplayer game modes. We haven’t covered the game since the campaign’s inception—it’s been in development for the last two years—but since then developer Midgar Studio has been mighty busy bringing the project to life. Hover: Revolt of Gamers has gone through six versions of its alpha, and it’s currently available on Steam as an Early Access title for $21.99 CDN. The steam community verdict is in; roughly 300 reviews have been penned by newcomers to the parkour title, and the game is touted as being “Very Positive” (Steam’s label, not mine). Midgar Studio has been keeping its faithful 3,843 backers in the loop all the way through the development process, releasing Kickstarter updates every other month or so on the game’s progress: bug fixes, alpha versions, and most recently, the announcement of a new playable character, Liff. 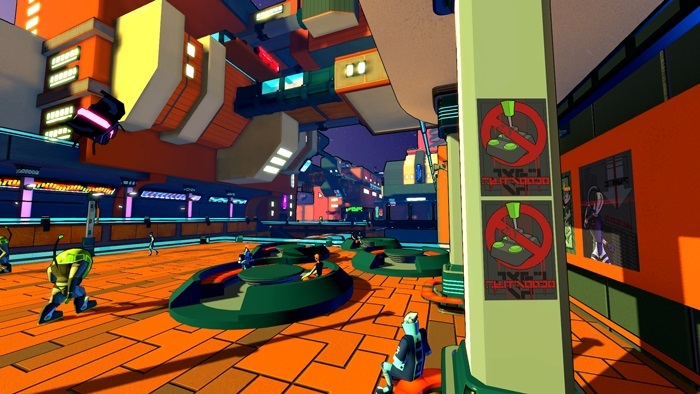 The following Kickstarter update will open access to a “special stage”, entitled the “sewers”, where you’ll be able to play “Race and Gameball Tournaments.” Overall, Hover is shaping up to be a great Kickstarter campaign, if not a great game period.